T-minus 11 days until Christmas! Which means I better get cracking on my gift shopping. 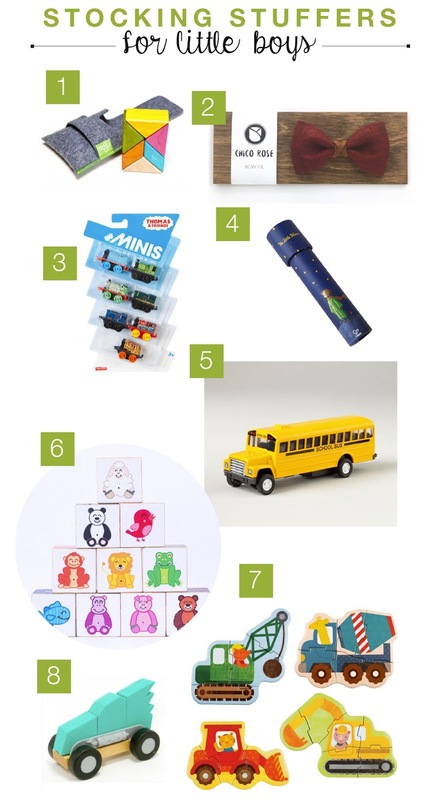 Today I've put together a stocking stuffers guide for little boys ages 18 months to 4 years. If your little guy is like mine, your house is stocked with all the cars, trucks, blocks and trains. Even when trying to find "new" gift ideas, sticking to the basics always wins. If it ain't broke, don't fix it. This guide includes some of our favorites, plus a few new toys we're excited to play with. Enjoy! 01 Tegu 6-Piece Pocket Pouch - I've always wanted to snag some of these awesome magnetic blocks! They come in a variety of sizes and colors, but these are definitely my fav. They are colorful, travel-sized + come in the cutest felt pouch to keep everything together. I'm thinking "church bag" item here! 02 Chico Rose Bow Tie - Holiday outfits always stress me out a bit, especially for little guys. It's pretty much a white shirt + dress pants. My sister recently introduced me to the Chico Rose. The bow ties are made of felt and leather + come in a variety of colors. On top of that, the owner is absolutely darling. And BONUS! She makes little girl headbands that are equally as adorable. And under $15! 03 Thomas & Friends Minis - These are the best, right? Trains and MINI! We love them in our house and there are so many different ones to collect. They are also really handy to keep in the diaper bag or in the car because they are small. 04 Hape Voyager Kaleidoscope - Both my kiddos have recently discovered how fun a kaleidoscope can be at our favorite museum. It hit me then that this could be a great way to spend time together. Come to find out, they are a little tricky to find, but Hape Toys always pulls through. Now just to teach the little one how to use it. 05 Pull and Go School Bus - We LOVE buses in our house! Every morning is spend looking out the window waiting for the morning bus to drive by. Plus the pull-and-go vehicles always leave my son cracking up after they crash into all the things. Pull-and- go + BUS equals win, win, win! 06 DIY Color Blocks - A sweet friend of mine designed these color blocks to help her daughters interact and learn. They are genius + soooooo creative! My son is a lot like me, which means he loves to organize and rearrange. These are a simple DIY to make for your kiddos and a fun way to get on the floor and play together. 07 Petit Collage Construction Puzzle - My son is really into figuring out puzzles! So much so that he gets frustrated that he can't put them together. Petit Collage ALWAYS has the most beautiful puzzles, we have many of these The construction set is perfect for little ones because the individual puzzles consist of 3-5 pieces. Perfect fit! 08 ModMobiles by Fat Brain Toys - My favorite local shop (The Baby Cubby) recently posted a video on these ModMobiles by Fat Brain Toys. It was love at first site. These little cars offer the ability for kids to design their own cars + drive them around. There are endless possibilities!